Completely revised with the most up-to-date research and including brand new chapters, Annual Plant Reviews, Volume 50: Plant Mitochondria, 2nd Edition presents the multifaceted roles of mitochondria in plants. The book starts with a short history of plant mitochondrial research; discusses how coevolution shaped plant mitochondrial gene expression; explains control of number, shape, size, and motility of mitochondria; delves into stress responses and roles in stress alleviation in mitochondrial biochemistry; covers the damage repair pathway of the Calvin-Benson cycle; and more. Containing sections written by many of the world’s leading researchers in this area, this book brings together and reviews for the first time many recent advances. 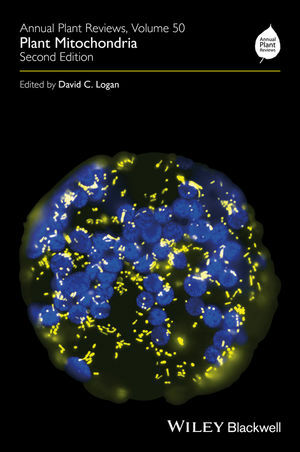 It offers chapters on: Bioblasts, Cytomikrosomen & Chondriosomes; The Crosstalk Between Genomes; The Dynamic Chondriome; Metal Homeostasis in Plant Mitochondria; RNA Metabolism and Transcript Regulation; Mitochondrial Regulation and Signalling in the Photosynthetic Cell; Mitochondrial Biochemistry; Ecophysiology of Plant Respiration; Photorespiration; and Mitochondria and Cell Death. Annual Plant Reviews, Volume 50: Plant Mitochondria, 2nd Edition is an extremely important and timely book that will be of great use and interest to plant scientists, cell and molecular biologists, and biochemists. Institut de Recherche en Horticulture et Semences, Université d'Angers, France.